Assistant Amir, Jamaat-e-Islami Hind Kerala chapter. Director of Islamic Publishing House, Kerala. Sheikh Mohammed Karakunnu (Malayalam:ശൈഖ് മുഹമ്മദ് കാരകുന്ന്) is a prominent Islamic scholar and author from Kerala, India. He is the Assistant Amir of Jamaat-e-Islami Hind, Kerala chapter. He authored more than sixty books and has delivered numerous speeches on Islam, Muslim and Jamat-e-islami.He served as Director of Islamic Publishing House, Kerala. Sheikh Mohammed was born to Mohammed Haji and Fatima on 1950 July 15 at Karakkunnu, a village near Manjeri in malappuram district, kerala. He completed his education from Farooq Raudathul Uloom Arabic College, Kozhikode. He worked as a teacher in various government High schools. Later he took voluntary retirement and fully concentrated in writing and speeches for Islamic Dawah and propagation. He was executive member of Jamat-e-islami Hind and its kerala chapter. He is married to Amina. Aneez Mohammed, Dr. Aleef Mohammed, Dr. Basima, Ayman Mohammed are their children. He served as Director of Islamic Publishing House, Kerala. 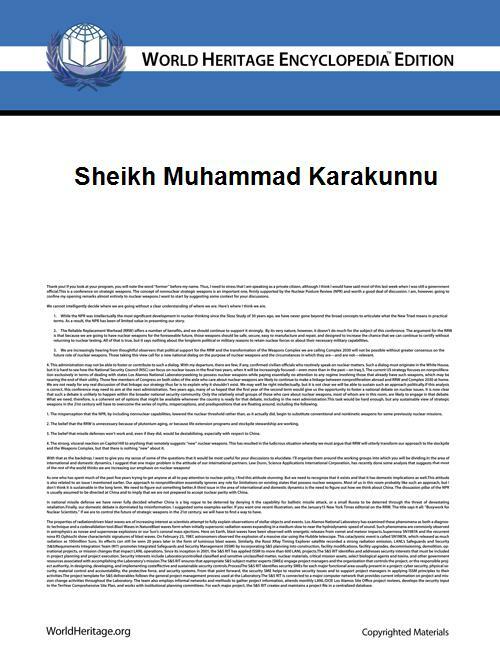 Sheikh Mohammed Karakunnu has authored 47 Islamic books and translated another 14. He also directed the project for releasing an electronic edition in Malayalam of Tafheemul Qur’an, the popular commentary of the Qur'an in six volumes by Abul Ala Maududi.